This is a part that used to always be overlooked on a restoration. Why, you may ask? Well, I think it probably was because if the transmission or shifter was ever taken out of the Mustang, this part was not put back on. Most of the time it was torn, and the mechanic thought that it really was not needed. Also the part just simply was not available. With the quality of restorations reaching the level that you see today, this is a part that is not getting overlooked. It was on there when your Mustang was new, and now it is available. What exactly is this part? Well, it is a rubber "boot" that fits around the shifter. Now, when I say "shifter," I mean the actual shifter-this is the mechanism that the shift lever handle, that you see inside the car, bolts to. This rubber boot keeps dirt and grime away from the shifter itself. 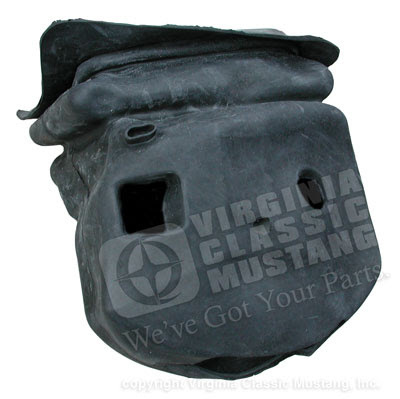 We have sold the boots for the 65-68 3 and 4 speed Mustangs for quite a while. 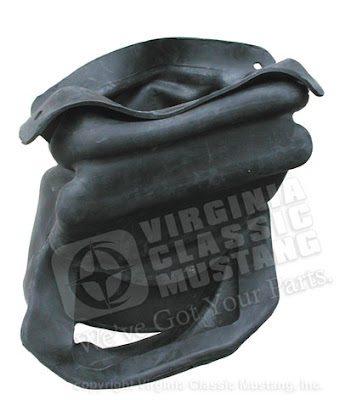 They are now available for the 1969 and 1970 Mustangs with 4 speed transmissions. Up to this point, original ones have been very difficult to find. When you did find one, it was very expensive.